Bizarro is brought to you today by The Face of Fear. Although I admit that I think Glenn Beck is a dangerous lunatic, I didn't see this cartoon as particularly partisan. Mostly, it is just meant to describe Beck as someone who believes in The Devil and would debate him if he could. Both of which I'd guess are true. And most readers did not take offense or I would have gotten more complaints. As it is, I only received one comment on this cartoon and I'm not sure it was even a complaint, per se. It follows, in its entirety, minus the signature. "I like Bizarro in my daily newspaper. I like Glenn Beck better." I assume this person thought this cartoon was vaguely offensive to Beck, but I'm not sure in what way. If you're a follower of Beck's and believe him to be a sensible person in control of his mental faculties, what would be offensive about this? I can't see it. Perhaps it is the fact that this cartoon is only actually humorous to those of us who see him as insane and fans of his find this notion offensive in and of itself. Which I suppose I can understand. For readers who like both Bizarro and Beck, I hope I haven't lost you on this. I've given up on hoping that anything I say or do will ever contribute to sensible politics on planet Earth, I'm just resigned to trying to make people laugh, make a living and sleep indoors. The overwhelming majority of my cartoons are not political so there's still plenty to enjoy. If the Devil was good enough for Daniel Webster, it should be good enough for Glenn Beck. You happened to show a thing about Glen B. on the day after Rachel Maddow used the term "Bizarro comic" (though not directly about your comics, more about the Bizaro world) as she discusses the propaganda tactics of the right. Anyway, I wanted to draw the piece linked below to your attention. 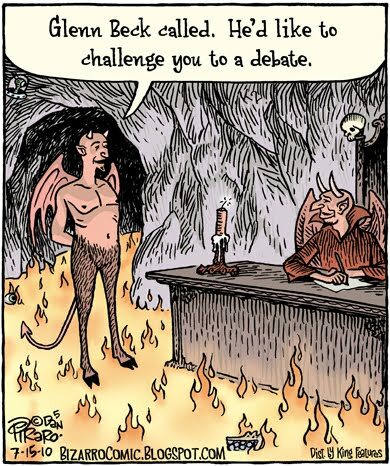 I find the idea that Glen B (name not spelled out due to disrespect) would want to debate the devil quite funny, I just hope he loses. As much as I don't like the guy, I feel bad for him going blind. Wouldn't wish that on anyone. 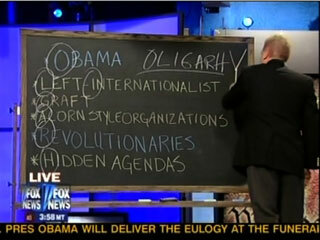 I don't like Glenn Beck, but I think there are much more dangerous people. Why don't you make fun of Mahmoud Ahmadinejad for a change? This commenter obviously wants you to feature or at least mention Beck in every cartoon from now on. I thought Beck was mainly debating with himself. I would love to see him at least once in the DailyShow though. Jeremy Rothe-Kushel: "No.. I'm talking about 9/11"
Bob Kerrey: "That's what I'm talking about"
I don't think it was a complaint, so much as it was a confession. Funny how real assholes hate to be told they are. You should do one on a teacher in a madrassa telling the kids, "It is very very wrong to bomb and kill 500 infidels in their church, but god will forgive you because they are all dead because it is the will of god." Sort of the same reckoning the extreme right uses. Thanks to everyone for the comments. Very amusing. @James...Ahmedinejad isn't funny and likely not nearly as dangerous to America as lunatic pundits. In my opinion. @Prospero...I almost never ride subways in NYC when its warm enough to ride my motorcycle. I did go from Brooklyn to Times Square on Thursday night on the 2 or 3 train, though. If you think you see me again, say hello. I'll tell you whether or not it is me.